Happy March! Buds are appearing on our lilac bushes, sunshine is streaming through the window and baby chicks are chirping at the feed store ... tangible signs that new life is emerging and spring is approaching. Our chickens are busily scratching and chomping any tender greens that poke up in the back yard. I’ve given up any attempts to grow flowers out back and instead focus on filling pots with flowers in front. I love the fresh feeling of this new season and planting red geraniums in our window box is always a beautiful way to celebrate it. With thoughts of spring comes the welcome anticipation of spending more time outside. When my sons played baseball in Little League our spring evenings were spent at the ball field, eating dinner in the bleachers (usually four or five nights of the week!). Now Sam and Isaac are on the track and field team and there is only one weekly meet ... no need to be planning portable dinners quite as often. I still welcome an easy dinner to take outside, though. 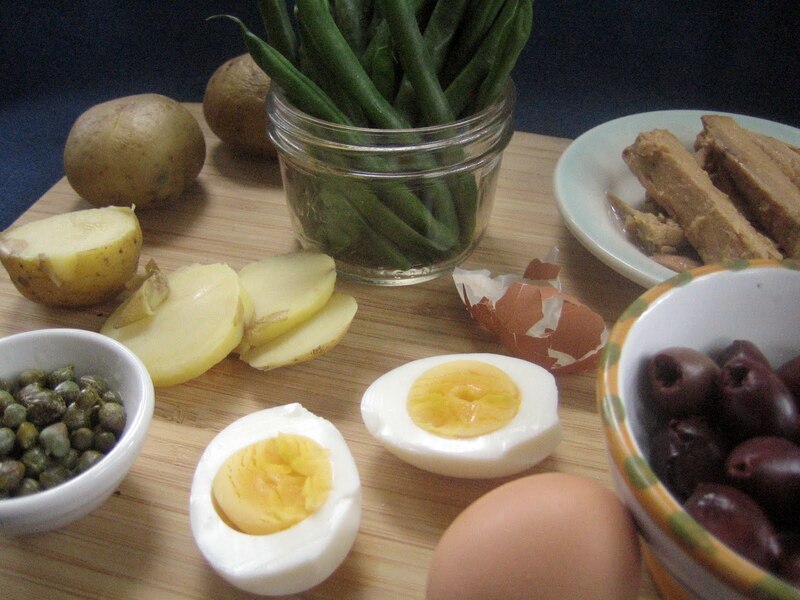 One of my favorite salads is the classic Nicoise Salad. Packed with protein and an explosion of flavors, it is a meal in itself. A terrific way to enjoy this salad when on the go is to stuff a crusty baguette with it and head to the baseball game (or lacrosse, or soccer...). When biting into this Tuna Nicoise Baguette, my taste buds came alive – salty, pungent, briny and piquant. 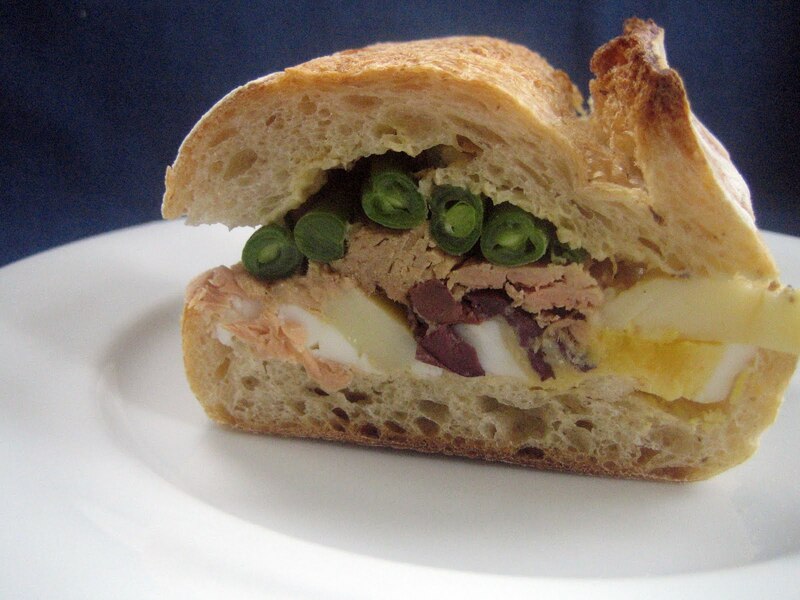 The sandwiches improve if made ahead, so they are easy to prep and stash in the fridge until you head outdoors. By the way, I’ve recently become a convert to tuna packed in olive oil. For most of my life I’ve been eating tuna canned in water and had no idea what I was missing. Tuna packed in water is bland and needs mayo, pickles, celery, vinegar and lots more to add taste. By the time you’re done preparing it, you no longer taste the tuna but only what you’ve added. In contrast, tuna packed in olive oil can be enjoyed unadorned. It tastes simply of tuna. 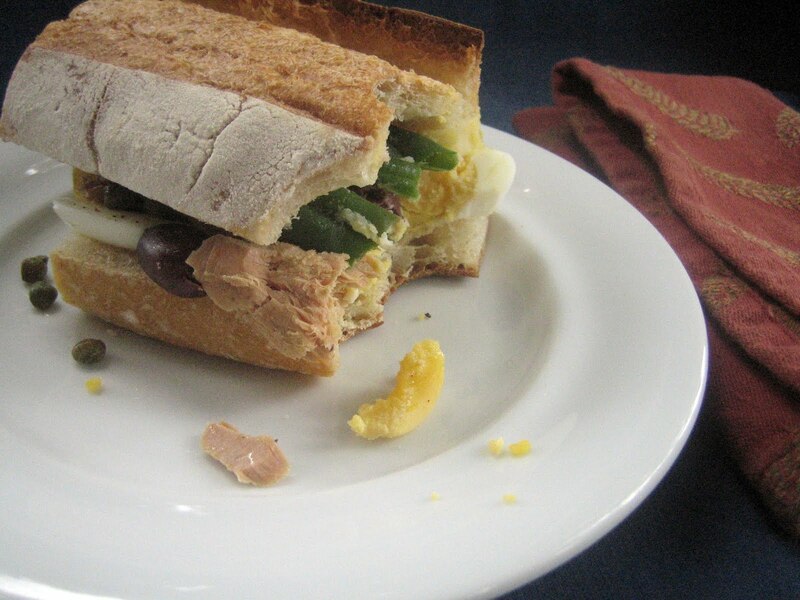 Since tuna is central to Nicoise Salad it is crucial to use the most flavorful possible in these Tuna Nicoise Baguettes. Cut the baguette into four equal lengths. Slice each in half lengthwise and pull a portion of the interior out to create a hollow area to fill. Keep the interior bread for future croutons (I have a bag in the freezer that I add to and use as needed). Lay the baguette halves out on a cutting board for assembling. Combine the mustard, red wine vinegar and olive oil in a jar. Cover and shake until combined. 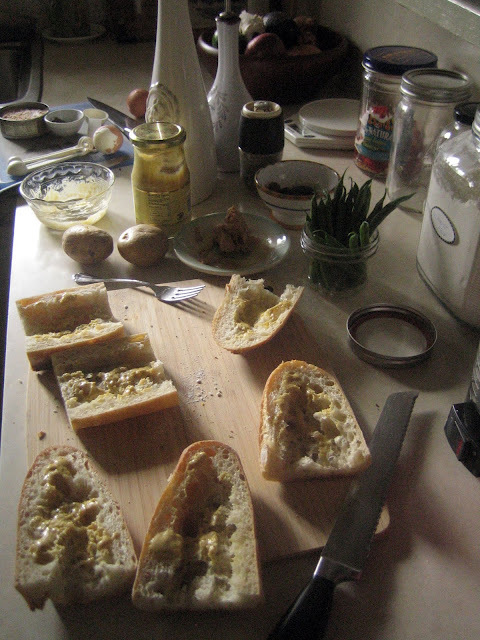 Spread a little on the inside of each baguette half. Place the sliced potatoes in a medium sized bowl and add the remaining dressing. Toss gently to coat the slices. 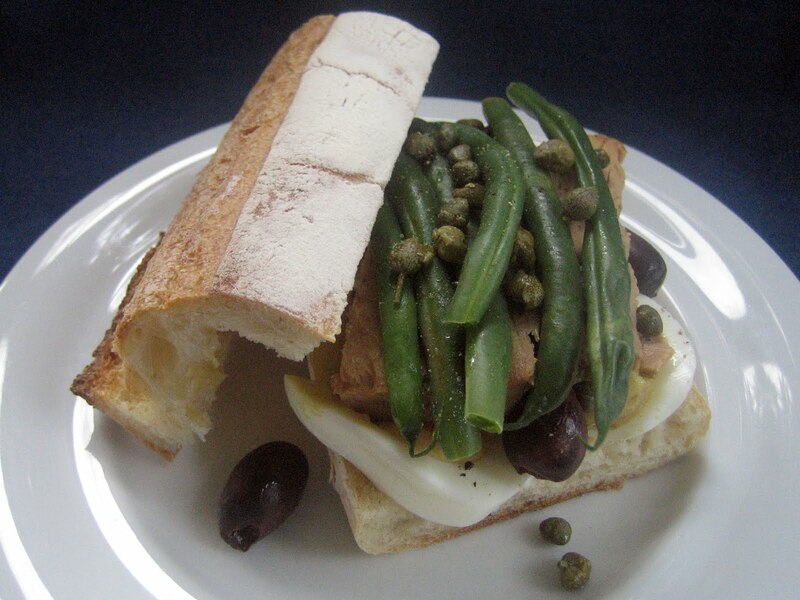 Begin layering the ingredients equally on the four baguette bottoms: eggs, potatoes, tuna, olives, green beans and capers. Salt and pepper to taste and place baguette tops on. Wrap each sandwich tightly in plastic wrap and chill for a couple of hours. Remove from the fridge about 20 minutes before you plan to eat them. I thought I was the queen of "slap anything between bread and call it a sandwich," but this goes way above and beyond anything I've done. I LOVE it, Hannah! I'm a true believer in olive oil-packed tuna, too, by the way. Beautiful job here. My thoughts were on the same track today, spring with warm temps, green markets coming alive with fresh vegetables and then the summer fruits. What a beautiful sandwich I made a warm salad today with potatoes, green beans and fennel with a citrus vinaigrette and it reminded me of spring. Love Salad Nicoise! Thank you, Suzanne! Your salad sounds marvelous - love fennel and citrus. I have spring on my mind but we don't have the warm temperatures here yet. I can't wait to see more at the farmers' markets! Aw, thank you, Brooke! Spring and baguette are happy words - totally agree! What a great idea! And I love that these actually keep well. Perfect picnic fare, although I'm not ready to start eating outside until it's quite a bit warmer! Thank you, Rowdy Chowgirl! I may have spring on my mind, but I agree...too cold to be eating outside yet. Many of those baseball games were spent huddling under blankets while we ate - not the best picnic weather. Hopefully we'll have a warm spring this year! We've basically had no winter this year and have jumped straight to spring, so I'm already thinking about picnics and eating outdoors! Paul loathes tuna, so I usually make a niçoise with salmon or even poultry (duck was particularly good). I love the idea of putting it on a sandwich! I think we got your winter here, Lauren. We had more snow showers this week, in fact. I like your suggestions - my family loves duck and would definitely enjoy that option. What a fresh, gorgeous sandwich! My husband would love these. And I love that it's the kind of sandwich where the flavor improves after sitting for a bit. Thank you, Katherine! I'm definitely a fan of food that improves over time - lovely to let the flavors marry.